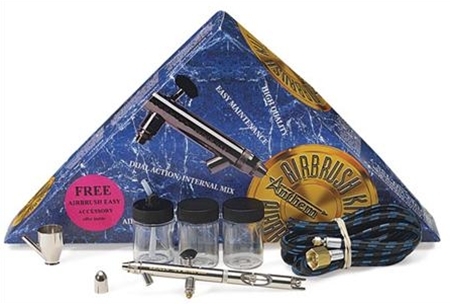 Badger 155 Anthem Airbrush Set .The Model 155, "Anthem" is a bottom feed double action, internal mix airbrush. 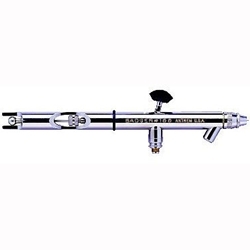 The Anthem is the most comfortable, reliable, proficient, cost effective, user friendly airbrush ever. The two angle needle tip precisely mates with the Anthem&#39;s cone shape nozzle enabling a single needle/nozzle variations. The Anthem&#39;s body design provides exacting balance and long term user comfort. The most rigorous of production airbrushing environments. The 155-7 Set contains 155 Anthem airbrush with all purpose nozzle / needle, attachable jar, two additional jars with covers, 1/4 oz. color cup, air hose with varying air source fitting, trigger pad, protective cap, and instruction manual in an attractive triangular box.